If there is one stereotype that Dev8d well and truly banishes it is that developers are unsociable nerds who prefer to code alone. The community, networking and collaboration at Dev8D is one of the most immediately noticeable features of the event and, according to the participants, the most valuable. “I really enjoy drive-by debugging when you just happen to be able to solve a problem for that chap coding next to you, that’s really satisfying,” explains University of Southampton developer Chris Gutteridge. Another, Steve Coppin from the University of Kent, describes how, through collaboration, his team has been able to work more efficiently on a project they brought to Dev8D. Community networking and collaboration means that more gets done in a shorter space of time because resources and expertise are pooled. Connections between developers are made that can be drawn on again in the future, and links are made between projects and people working in similar areas, or with complementary or contrasting skill sets. Developers benefit by learning from each other, institutions benefit from the wider knowledge base their developers have access to, and, ultimately, society benefits from the way in which the creativity and innovation of these developers both supports the researchers they work with and helps to make the internet is a better space for everyone. 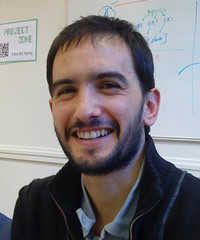 “I would argue that mixing talented people together in such a fashion is definitely very good for the software industry in the UK,” says Pascal Belouin, who is researching social science for software developers. The success of Dev8D in this respect has led to calls for the concept to be replicated in other parts of the world, and at more regular intervals. One idea is to make the event quarterly and international because, says McLean, “it would allow the ideas and concepts that emerge to get a refresh every few months and you could track areas you are interested in through tweets and blogging”. But could the Dev8D community also work virtually? Graham Klyne, from Oxford University, is part of the Developer Focus group that is looking at ways to build the community. He’s exploring the possibility of extending the notion of “developers training developers” – which is better and more cost effective than most of the alternatives – beyond the relatively small number who can physically attend Dev8D and move it into a virtual space, with a focus on the particular kinds of problems facing higher education and further education developers. “We’ve identified the fact that vibrant communities of interest already exist but, in many cases, there are not easily exploited links between those communities. For example, I’m fairly well connected with the linked data community but when I’m working with single sign on security I don’t know where to go outside my institution,” explains Klyne. The notion behind what he has dubbed “who you gonna call” is that when a developer hits a technical problem that might be particular to higher and further education institutions, then they always have a community to turn to for advice. This entry was posted in Uncategorized on March 8, 2010 by Michelle Pauli. An iPhone app for conference schedules with augmented reality, a Firefox extension for browsing historic web pages, a widget to allow real time collaboration between VLE users, a mash-up of geo-located museum collection images: for a glimpse of how much a community of enthusiastic developers can achieve in just a few days, take a look at the list of projects produced in response to the challenges held at Dev8D. All these apps, widgets or websites were created by Dev8D developers in only three days. They are all tangible achievements: tools that can be used right now, or, in a more polished version, in the near future. The majority of these new tools would not have existed without Dev8D, either because of a lack of time in developers’ pressurised day-to-day workflows or a knowledge or skills gap. Dev8D and the other developers at the event provided this space and filled those gaps. Some of the projects may remain as interesting proofs of concept and will be built on by others or used to spark off further ideas; many others will be developed into fully fledged applications for use in the higher and further education sector. Take, for example, List8D, the winner of last year’s contest. This user-friendly reading list management system makes it easy for academic staff to create reading lists, for libraries to manage stock and make sure texts are available when needed, and for students to access the reading lists on a variety of devices. Following Dev8D, the project was picked up enthusiastically by the developer team’s university, Kent, was awarded extra grant money and is now in beta mode at Kent, with a full rollout planned for later this year. “As a result of Dev8D we’re developing a system that’s hopefully going to massively improve the management of our reading lists. And without Dev8D that probably wouldn’t have happened,” says Ben Charlton, the project’s lead developer. Splash URL is another success story of last year’s event. It’s a tool to create a short version of URL and display it in large type, so people can easily copy it from a projector to their laptop during lectures. Designed to solve the problem of getting an audience to quickly type in long URLs during a live demo, it has proved itself in practice over the year to the extent that developers Chris Gutteridge and Tony Hirst have enhanced it with extra features. Dev8D 2010 produced a host of new ideas. “A few developers, including myself, produced a set of web widgets to integrate with VLEs … People found new uses for existing public APIs. The Arduino workshops produced a storm of ideas for new electronic devices,” explains Mark Johnson, a young developer at the event. Other projects on display included a low cost electronic whiteboard; an open source eco game; and RepRap, a self-replicating 3D printer with potentially huge implications for small-scale manufacturing in developing countries. “When I heard about RepRap for the first time it was partly responsible for renewing my faith in the potential of technology to help us get us out of the mess we’re in, rather than just making it worse. I was pleased to see it in the flesh, and meet one of those responsible, ask some lingering questions, and get some reassurance that fine minds are at work on the home plastic recycling plant that it really needs to be sustainable,” says Ben Wheeler. What Dev8D demonstrates beyond doubt is the cost-effectiveness of gathering a large group of developers together in one place to share and collaborate in an informal setting. The cross-institutional collaboration work on projects devised at Dev8D continues long after the event itself is over and, of course, the impact of the achievements of Dev8D extends far beyond the participants and their institutions. On a small scale this can be seen in the interest in the event while it was taking place – analysis made possible by a tool that developer Dave Challis created while at the event showed that while dev8D was attended by 150 or so people per day, it was mentioned by around 500 different people on Twitter. The impact of the many innovative, time- and money-saving projects initiated and inspired by Dev8D participants will be far wider still. One of the more unusual and exciting aspects of Dev8D is the idea of ‘bounties’, where developers create something during the event in response to a specific challenge. It calls for fast and furious coding, collaboration to draw on others’ expertise, and…a lot of caffeine. The coding-collaboration-caffeine combination produces some impressive results. There were entries in all categories – read on for all the ideas and to find out who won. Dev8D: where were the women? Dev8D was exciting, friendly, encouraging, nurturing and… almost entirely populated by men. Of nearly 300 attendees, only 20 – that’s 7% – were women. The technology/web development industry is notoriously male-dominated, but even in this context the gender imbalance at Dev8D seemed disproportionate. We’d like to know what you think. Are we doing enough to attracted women to these kinds of events? What could we do to improve the gender balance? Do you even think it’s an issue? We’d really appreciate your ideas and opinions on this issue, so please do leave a comment or get in touch with DevCSI with your thoughts. This entry was posted in Dev8D 2010 on March 7, 2010 by MShaw. What makes a book a book? If you've ever wondered what a book would look like printed out on a till receipt roll, like a digital age On the Road, then ponder no longer. Ben O'Steen has done just that with Cory Doctorow's latest novel, Makers. First point to note is that this experiment is possible because Doctorow releases all his books under a Creative Commons licence, which makes such coolness both straightforward and legal. Anyone can download the book for free, reformat it to suit their needs and then print it – or not – as they wish. But while O'Steen's book-as-a-till-receipt is funny, quirky, and also surprisingly aesthetically pleasing, he is making a more serious point about the way we read, online and offline. O'Steen is also intrigued by the trust that people put into receipts and signatures. They really shouldn't, he argues, when “for fifty pounds on eBay you can buy a receipt printer that can completely replicate the average receipt.” Anybody wanting to fake a receipt simply needs to scan one in, so that it can even have the right logo and other shop or restaurant details, add in their own sums and then print it off. These printing experiments are part of a wider exploration of the spectrum between physical and digital. He demonstrates a cute mini Polaroid printer, a mobile Bluetooth device that prints on small cards. While these may seem ideal for children's parties, O'Steen has ideas of how this neat little gadget could be put to more educational uses. The final part of O'Steen's digital/physical project was to take an object that was born digital – in this case his blog – print it out and turn it into a hardback book. Find out how the experiment fared on O'Steen's blog, Random Hacks. This entry was posted in Uncategorized on March 1, 2010 by Michelle Pauli. Museums need to stop building websites and start taking a stealth approach to getting their content out to new audiences, says Katie Pekacar of the Museums Libraries and Archives Council (MLA). At Dev8D she issued a challenge to developers to come up with ideas to take the rich collections offered by the cultural heritage sector and find ingenious new ways to open them up. Here she explains the thinking behind the challenge. Why are you at Dev8D? The issue we keep coming across is that there is a lot of amazing content out there but much of it is hidden. The answer is not to build more websites but to find ways to bring content together so that it makes sense to people, and to put it in unexpected places, places they more commonly go to where it is not necessarily signposted as museum content. We want to be able to get this stuff into people’s lives – infiltrate it, you could say! To do this, we need to make links between those who can do this stuff and those in the sector who are less digitally inclined. We’re thinking about some kind of ‘buddying’ scheme for the sector where people can work together to see what can be done, and we will end up with better quality data at the end. What kind of datasets are on offer? There’s a wide range. For example, Culture 24, which is a bit like a cultural Time Out, covers 3400 venues with mapping geo data, images and editorial for them. Also included in the dataset on offer at Dev8D are images from the Women’s Library and Durham Oriental Museum (right). What kinds of ideas have developers here been talking to you about? The response has been fantastic! One idea has been to use facial recognition techniques against some of the old paintings in the collections so you can find out which figures from history you most look like, and then maybe put it on your Facebook page as your profile picture. Or using Google Maps and uploading collection images relating to areas so that when look at the map, interesting images from the collection appear rather than a picture of the building. It’s a very simple way of piquing interest. It’s these kinds of ideas and creativity we’re looking for. It’s about finding a hook, different ways of engaging. How have you found Dev8D? I expected it to be lots of geeks with computers and didn’t expect it to be so easy to engage with people. I thought that they would be peering at computer screens full of lines and lines of code but I’m seeing stuff I recognise. I also wasn’t expecting there to be so much networking. I thought I would hover around feeling confused for most of the day so it’s been great not to feel like that. I can imagine bringing curators to this kind of thing, and though they might not necessarily understand everything that’s going on, they would be able to talk to people here about the collections and find stuff out and people would be interested. I’ve also been really pleased by how many people want to work on projects that you can sum up in a sentence, that can be explained so that anyone can understand, and that’s what we need in terms of outputs. People find it hard to understand what you mean by ‘code’ but if you say here’s a widget that helps you find images by keyword in your area then they get it. This idea of opening up data is tricky topic in the sector but the way to go about it is to show the benefits of doing it and then people will be queuing up to do it. Scientists and developers are a match made in heaven, says Ian Mulvany, the product manager of Nature journal’s Nature Network. He explains what Nature is hoping to achieve by working with the developer community, what it can offer them, and the first steps it is taking to build connections. Why is Nature, a journal, interested in developers? Nature is well known for the journals we produce but it is increasingly important to be able to provide services to scientists and be able to provide objects which go beyond or transcend a journal so we have introduced various experiments for creating web applications for scientists, including Nature Proceedings; Nature Network; and Connotea, a kind of Delicious for scientists. Nature Network, which has tens of thousands of users, is for people with a large investment in being scientists – it is domain-specific and we have a lot of researchers who use it on a day-to-day basis to explore the process and sociability of what it is to be a scientists, from issues with grant proposals to glitches and successes in experiments. I know from even just talking to developers without a physical science background that there is a lot of interest in science in the hacker/geek community – people are interested in helping science, they think it’s cool. We’re hoping to be able to tap into that and that by hosting this network and allowing developers to provide tools for that segment of people we will find a good match. What steps are you taking to hook up the scientific and developer communities? We’re adopting the Open Social api and releasing it into Nature Network in a month or so. We went for Open Social because it already has a high level of take up (it’s supported by Linked In, iGoogle, Orkut among others). Introducing the api will allow us to do two things: firstly, we will be able to host tools on the site so that if you are a developer and have a good idea for a web-based tool that scientists will find interesting then you can upload it for them to use. It will enrich the experience of our users and give developers access to our high quality social network of scientists. Secondly, it allows us to make the activity on our network federated, so we can create feeds and let other people use the feeds and do interesting things. One thing I’m hoping will happen is that we can get a better idea of what scientists do, in the round as it were. At the moment scientists more or less only get credit for publishing academic papers but that’s such a small element of what they actually do. There are many other contributions, from producing and curating datasets to teaching and peer-reviewing, but these things are hard to see as they cannot be as easily identified. The longer-term vision for Nature Network is that we want to be able to aggregate around a person all the activities they think are important to them and in which they have participated. It’s the first step to having a web that understands what a person is doing and their integrated contribution and doesn’t simply identify research papers. I’d love to be able to get to the point where if someone is conducting an experiment they can hook it up through our api and have an update which says what they have just done and point to a URL for the results. What history does Nature have with working with developers? We’re only just staring in the process but we’ve created a couple of Wave robots, and we run a two day conference every summer, Scifoo, with O’Reilly and hosted by Google. We gather a whole range of science people together and throw them together to see what happens. Last summer all the Scifoo attendees got early access to Google Wave and that’s how we got interested in it. It’s not a Nature project harnessing Google Wave but a lot of people at Nature think it’s really interesting so have been hacking around it. We should be able to host Waves on network if we wish. What is Nature hoping to achieve from collaborating with developers? We’re very keen to work with people who have good ideas about how to improve the process of scientific communication. I’m interested in seeing how technology can go from the lab to being productionised. I see all these cool ideas at conferences and cool JISC-funded projects that end up having an impact at a local level and not going beyond that. I’m interested in ideas that we could take and roll out into our larger platform. We’ve been looking at entity extraction – and we’re now starting to mark up in our papers so that users will be able to go to a page and see links to all the papers that mention to that entity – and it’s been work from Peter Murray Rust’s lab showed that was a viable possibility. I’m also interested in getting to a point where we can start to embed data mining. Obviously, our articles are a very interesting data set but we don’t do much data mining on it at the moment. Our archive goes back to 1869 and it’s a snapshot, of course, but it represents the top end of what happens in science at a particular time. I’m interested in what terms rise in importance or disappear in importance over time. For example, the first paper to mention the electron does not mention the term electron. I would love to be able to map the flow of ideas through science and if someone had a compelling project we could arrange access for them. And what can Nature offer developers? We can offer three key things: access to an interesting network of people who can give good feedback; access to a lot of very interesting data; and, if we find something that is interesting, we can offer the ability to promote those ideas. This entry was posted in Uncategorized on February 27, 2010 by Michelle Pauli. “My idea is for an eco game. It’s going to be open source from the very beginning, which means there is no fixed plan for exactly how it will look, or what it will do. It’s still very much in the concept stages and we need people to get involved and help us guide it. The game needs to be centred around environmental issues. Perhaps we could use real-world data like Government statistics on climate change, or people’s individual carbon footprints. We could look at aggregating tweets or allowing people to record their browsing history, we could even hook in with arduinos to help people bring the game into their real worlds and create sensors for their homes. The game would be a challenge for players, with problems to solve and rewards to win – it would have to be a satisfying experience to make it fun to play. This entry was posted in Achievements, Community networking, Dev8D 2010, Interviews on February 27, 2010 by MShaw. I provide organisational support services, primarily in the support sector. What’s your interest in Dev8D? I do lots of work across different organisations such as education and government agencies, so I have quite a broad range of interests. I’m very interested in open source software, and also linked data – looking at how things join up together, and how to produce data which is visually interesting to people. Tony Hirst’s talk on Yahoo Pipes was also very good, as was the talk on vector graphics. A lot of the stuff you get at an event like this are like the discussions you have in the kitchen at a party. it’s all the interesting stuff on the edges. There’s lots of crossover in the kid of work I do – discussions on how you manage your workload, how to explain what you’re doing, issues around transparency. It’s interesting to make those connections. Are you involved in any other communities? If so, what and why? I’m part of a Google group working around open source software. I’m also involved in other non-technical communities through my work. Of all the projects or ideas you’ve seen, which will have a longer-term impact? The project with the wow factor has definitely been the 3D printer. It’s another great example of a cross-over service. This entry was posted in Community networking, Dev8D 2010, Interviews on February 26, 2010 by MShaw.